The Seattle Department of Transportation (SDOT) is going through a tough couple of years, and it doesn’t have a permanent leader. Mayor Jenny Durkan’s office has not made any indication that they are searching for a permanent SDOT director, though the administration has been in office for a year. Durkan’s staff did not respond to repeated questions from STB, starting on November 27, asking whether an SDOT director recruitment process was under way. The agency has had trouble completing the large capital projects it has asked to deliver. The First Hill streetcar opened several years late after delays from the vehicle manufacturer. The downtown Center City Connector streetcar has been delayed indefinitely, albeit due to interference from Durkan. More worryingly, SDOT has not delivered on the ambitious bike and bus projects promised in the Move Seattle levy, as Frank wrote yesterday. Move Seattle promised seven RapidRide bus lines on major corridors. Now, SDOT can only deliver four, and those projects are each delayed by at least a year. Madison BRT, which was supposed to be up and running next year, will instead launch in 2022. SDOT’s struggles can’t be helped by its recent leadership tumult. SDOT has been working under temporary directors for nearly a full year: the last permanent director, Scott Kubly, resigned on December 15, 2017. Kubly’s tenure was itself fraught, as Kubly was fined for ethics violations related to the city’s docked bikeshare program, Pronto. Goran Sparrman took over for Kubly until August of this year on an interim basis, then was himself replaced by the current interim director, Linea Laird. SDOT still has a full plate. 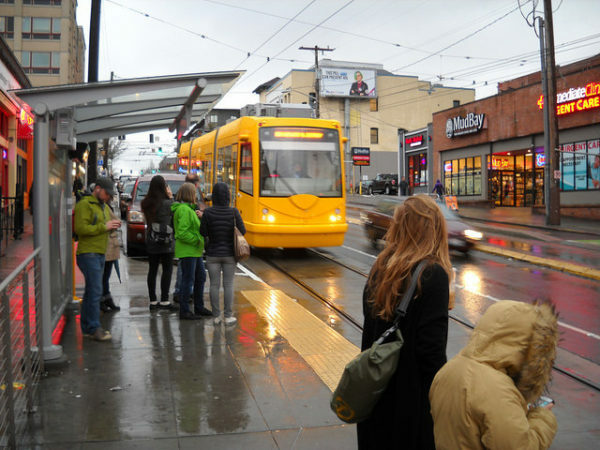 The downtown streetcar may still yet be built and RapidRide must be finished. The Viaduct is set to close on January 11 and be demolished over the course of 2019, while the Convention Center expansion will simultaneously kick off. In combination, those projects will cause all sorts of mobility complications on SDOT’s right of way. Meanwhile, Sound Transit will settle on its locally preferred alternative for the West Seattle and Ballard light rail lines in April. Those projects demand serious input, attention, and coordination from the City of Seattle. After all, the Sound Transit board is designed to silo spending in subareas, and dilute Seattle’s influence over capital project planning. Seattle stakeholders have generally expressed preferences for the most expensive alignments presented by ST. In West Seattle, for example, residents prefer a tunneled line near the junction. An elevated line would be much cheaper to construct, and would offer the same quality of service. The City of Seattle could defuse that tension by kicking in funds for West Seattle and Ballard extras, but the City Council and Durkan have been mum on the subject. Presumably, a permanent SDOT director would be an essential player in developing a City-directed third party funding plan. With so many generational projects at critical junctures, it’s surprising that Mayor Durkan has still not found an official to permanently direct them. The agency has had trouble completing the large capital projects it has asked to deliver. More worryingly, SDOT has not delivered on the ambitious bike and bus projects promised in the Move Seattle levy… SDOT’s struggles can’t be helped by its recent leadership tumult. Murray and Kubly were liars. They lied about MoveSeattle –they knew before the vote that they couldn’t build what they promised. They lied about the issues with the streetcar. Just about all of the problems that SDOT is having are due to the previous administration’s lies. But not all of them. There is plenty of blame to go around for the ridiculous idea of placing the Ballard light rail station in West Woodland. Not only the mayor and the acting SDOT chief, but also Rob Johnson. None of them seem to know anything about the geography in the area, and are taking a “good enough” attitude towards a multi-billion dollar project that is essentially permanent. Of course, there is no evidence that Kubly knew anything about transit either, or that he would have done anything differently. It is hard to say with a straight face that the light rail expansion this city needs more than any other — the thing that will provide the greatest value for the city — is what we are building. Yes, you are absolutely right, it is crazy that the mayor hasn’t been more open about the search for a new director. But can you blame someone for being a little hesitant to take the job given the current mess that exists here? The search for a new director is not helped by sugar-coating the situation. If anything, it makes it worse. Without full disclosure — without the city being fully aware of the mismanagement and deception by the previous administration — a new candidate would be hesitant to take the job. Why volunteer to take the blame for something you had absolutely no control over? I’m not saying the mayor shouldn’t be able to find someone good, but pretending that the problems are due to a rocky transition instead of gross incompetence and scandalous actions by the previous administration doesn’t help things. But why? Why would they lie like this? Did they just want the hero status associated with helping Seattle get seven RapidRide routes? Did they figure there won’t be consequences to outright lying about its feasibility because Seattle will always vote yes on transportation measures? If that’s the case, then why not just modify the plan to ask for more money to pay for everything? I just don’t get it. Seattle is extremely willing to pay for additional transit. It’s not like ST3 where ST planned very little contingency for costs to rise, so it could bring the top line funding figure down so more people in Piece County will vote for it. Seattle will always be happy to approve money to pay for things, but that could change if the city is intentionally deceiving voters. Just, why??? To pass it? I think you might be arguing they should just have asked for more money, and Seattleites would still have approved it, and perhaps that’s true, but I assume there is some finite limit to the size of the program above which it would not have passed. I suspect that they figured they were at or near that cap, and exaggerated what they could accomplish within it. @Alex — Yeah, that is the big question. My guess is Kubly had one foot out the door, and Murray was just too stupid to know what to do. Kubly strikes me as the type of guy who manages to make a lot of money based on his title. The corporate world is full of guys like that. Once you are a CEO, you can get another job as a CEO. Same with coaching. There are a lot of coaches (in college and the pros) with million dollar contracts even though the last three teams they coached had losing records. Murray (and Kubly) are both schmoozers. They know how to shake hands, remember names, spread the BS around, and otherwise appear like they know what they are doing. But neither had a record of accomplishment before taking on the responsibilities in Seattle. That is no excuse for the corrupt and unethical nature of their actions. There are plenty of schmoozers who would do the right thing. But it explains why they survived, and even flourished, with such obvious character flaws. The right thing to do — the responsible thing to do — would be to just level with Seattle. Tell the city that the calculations were wrong — you can’t build what we want to build. At that point you can either just let the levy go forward (with new estimates) or try again later. It is worth pointing out that Metro had a similar situation. They were facing what appeared to be a big shortfall. Then it came out that the economy was picking up, and there might not be a shortfall after all. Rather than continue to cry wolf, they just said “Great!”. If it turns out we don’t “need” the money, then we will just put the extra money into extra service. Next thing you know, Seattle has the best transit system it has ever had, and we are one of the few cities with increasing transit usage. Does anyone (other than the yahoos at the Seattle Times editorial board) feel ripped off because Metro didn’t “need” the money. Of course not. We just feel sorry for places like Bellevue and Kirkland and wish they had it as well as we do. “Metro” didn’t do that, Councilmember Dembrowski did. He canceled the last two rounds of recession cuts gambling that the recovering economy would catch up to it in a year, and it did. I don’t approve of such risky gambles, but it worked this time, and then the Amazon expansion boom pushed it even higher. Fun fact: if the economy hadn’t crashed due to misrated mortgage securities and liar loans and unregulated CDOs, the Amazon expansion would have started sooner and we would have gone straight from fast-rising rent/house prices in the 00s to hyper-rising prices in the Amazon expansion with no three-year breather in between. I think that would likely have increased prices even higher than they are now and made the housing emergency even more acute. Er, he didn’t unilaterally do it, but he convinced the council to. >> We just feel sorry for places like Bellevue and Kirkland and wish they had it as well as we do. This posting has also been all over Linkedin the past couple of months. You’d think they’d have headhunters out for a position like this, instead of waiting for Joe Schmo to walk in and apply online. I bet there are competent people working in SDOT who have asked the right questions all along, privately, through the chain of command. Don’t assume the whole staff is part of the problem. Inverview them if they are interested. Excellent idea, Brent. At every level of government in our country tonight, diminishing thousands of capable and qualified people are literally so sick of what’s become of their work. that no department has any of those airplane bags left. If the Anarchists were unionized , their shop stewards would be overwhelmed by grievances over a “Runaround”…work rightly theirs assigned to someone behind them in line. By contract, destroying the Establishment was their work. The number of civil service positions left completely unfilled after massive voluntary retirement for all those stricken with convulsive addiction to competence. Leaving their new-hired superiors and Cabinet secretaries free to concentrate on transfer of public resources to the water, soil, and air. Shame bureaucracy is so bi-syllablically “Boooooooo-ring!” Because calling people with this pathetic level of rabidly justified outrage “Enemies of our Country” makes Benedict Arnold whimper in his grave over the injustice. So if you can find their hiding places or countries of refuge, especially for the few actual Republicans left alive, who’ve got the price of last arctic silver fox on their heads…..think they’ll feel safest with you doing the interview. I have asked something similar in past open threads, so I ask STB and the horde: who do you want (specific names) that would realistically want the job? It will almost certainly be an external, non-local candidate. It sounds that way. But bringing in directors whose main qualification is that they are trying to get out of another director gig somewhere else across the country, while punishing an entire workforce for the failures of their previous director by not giving any of them a chance for promotion can be a bit demoralizing. Seems par for the course. Durkan has been decisive on one thing: Scooters can’t be allowed because people fall and get hurt. Are bikes next? Then cars, which actually hurt and kill a lot of innocent bystanders every year? And how has red paint hurt anyone lately? Has anyone gone to the hospital because the concrete they hit was painted red? Hyperbole much? Bikes have been around in our City longer than cars. Despite the ballyhooing from a very vocal minority, bikes will never be banned. Electric scooter share is a brand new thing to our City and the people in charge saw the obnoxious, unnecessary chaos that was happening in the other cities that had allowed electric scooter share and decided that the tiny benefit was not worth the mess they caused. Especially with bike share ubiquitous in Seattle, the pro electric scooter share has not shown a good reason for scooter share. You complain about hyperbole, and then in the next paragraph say scooters cause “chaos”. Come to Tacoma, no chaos here, just folks with another easy, affordable way to get around. Go to Portland, Silicon Valley or even Madrid, Spain. Chaos is not a hyperbole, it might even be an understatement. The problem is e-scooters on sidewalks startling pedestrians and running over them. Skateboards don’t go as fast, and bikes have been around for decades and bicyclists are used to keeping at pedestrian speed on sidewalks. But with an e-scooter it seems too easy to ramp up the speed without noticing it or caring. All these are fine on the street, but I’m hesitant to allow e-scooters on sidewalks, or to rush into a decision just because other cities have done so. Having e-scooters in bike lanes or on the Burke-Gilman creates the opposite problem, of scooters slowing down bikes. The Burke-Gilman already gets full at rush hour so bikes have to slow down. Scooters add to the congestion. The problem with just throwing the doors open to e-scooters now as a few other cities have done, is it changes the dynamics of fast-and-established bikes, slow-and-established pedestrians, and medium-and-unestablished scooters, and could end up making things better for scooters but worse for everybody else. That’s exactly what happened with Uber: it made things better for Uber drivers and passengers but worse for everyone else. We shouldn’t rush into new technologies thinking they will make everything better. It worked with dockless bikeshare but I’m not so convinced about rideshare or scooter-share. The scooters in Tacoma are often faster than people on bikes. People complain any time the norm is challenged. I see more people on scooters in Tacoma than I do on bikes. Anything that gets people out of cars should be welcomed. Ban cars if you want Seattle to be safer. The anger and fear about scooters only illustrates one thing: we don’t have enough infrastructure available for alternative transportation. Buses and streetcars are big and unavoidable. Cars have no choice but to deal with them. Bikes are incredibly flexible, and can generally survive side-by-side with cars. But there’s not enough separated bike infrastructure to accommodate other modes. And car drivers don’t want to give up anything. Just so they let the red paint dry first. I am surprised that we don’t yet have a director. I think the job is however difficult; who wants to be the bad guy and tell every interest group that they can’t have what they want? Seattle interest groups seem to feel that anything short of full adoption of their wish list is a failure. That includes those that want no-fee auto tags to no cars on streets to free transit for everyone to bicycle tracks or PBLs on every major street to sky-high parking rates that increasingly extend across most of the evening. Meanwhile, the pothole and bad pavement problem is seemingly worse. Without pavement, almost everyone suffers. Move Seattle is not only underfunded but it’s not poised to fix our quickly detiorating pavements. So this person has to be armed to be a bad news giver. This is on top of managing a huge staff, coordinating with lots of other city departments and other agencies, and managing special funds. Perhaps we need to put a senior team in place and not have so much burden put on one person. Then have one of that team be the “chair” and liaison to the Mayor. Darn those demanding urbanists who want things like bus right-of-way priority on streets used mostly by buses, the cheaper and more functional options on light rail grade, continuous safe sidewalks and bike paths to get around with much smaller output of CO2, fewer visits to the (ahem) trauma center by pedestrians and bicyclists, and having a levy pay for some of the relatively cheap bike and pedestrian projects it was supposed to help fund. You’d think they won a few elections or something. The term “urbanist” comes from the word used for trained “city planner” in other langages. To imply that it’s only for a certain kind of advocate is changing its meaning — and frankly casts aspersions towards the profession’s commitment to situational objectivity. Al S.: It is pretty easy to understand why city planners are generally in favor of mass transit and other non-car transport. It’s simple geometry! Of course, “urbanist” as a political label may well have originated from what I refer to as “drive everywhere activists”, especially on the political right? In fact, mass transit, walking, bicycling in cities should be just as politically boring as sewers. It’s just something you have to do in cities–and nobody questions having sewers rather than cheaper septic tanks because septic tanks simply wouldn’t fit. I have never heard of “urbanist” in other languages, and there are several words which have a unique meaning or history in English or particularly the US, including “liberal”, “conservative”, and “economist”. Urbanism is a development model characterized by walkability, density, and ubiquidous transit. That was universal among cities from before Ancient Rome through the pre-WWII streetcar suburbs, and is still mostly universal outside the US except in some recently-developing countries. The opposite is automobile-scaled development, strong decentralization with no clear center (as in most suburbs and Sunbelt cities and many Midwestern cities), or multipolar with many scattered job centers (e.g., Los Angeles). This is car-dependent and hard for transit to serve effectively. There are two kinds of decentralization: satellite cities which are dense peripheral nodes (like central Surrey in Vancouver), and peanut-butter sprawl where everything is low-to-medium density scattered everywhere (Silicon Valley). The former has good success stories; the latter is what I’m concerned about. Europe was veering more into the bad kind of decentralization in the 1960s and 70s, but after the oil shock in the 70s it realized the value of being more resilient from foreign oil and car dependency, and that led to a revival of “urbanist” density and transit and channeling growth that way. There’s also more prestige in traditional city features. When a western European capital or city or Moscow or St Petersburg want to expand, their highest prestige and practicality is metro lines and public plazas. Washington DC has some of this too, with the metro and all the plazas and the Mall, I think it’s to impress foreign diplomats that we’re a serious and competent country. And the northeast and Chicago and San Francisco have their legacy density and transit networks, which have a large enough constituency to keep them going. But in the rest of the US the prestige is more like freeways and big-box clusters and mini-marts at freeway exits, because a car and a yard and one-story businesses is the American Dream and proof of our success. There have been some movements back to denser downtowns and peripheral New Urbanism, which represent a revival of urbanism and a movement that needs a name, but they’re still a minority in US local/state/federal planning. So urbanism is a movement that needs a name in the US, while in the rest of the world it’s just “of course that’s how you build a well-functioning city, as we’ve known for centuries”. That’s what ear protectors are for, Al. And if your skull is really thick enough for the job, you won’t need a hard hat, but Department of Labor will make you wear one anyhow. Nature gave creatures, especially the ones that bark and howl, an iron-clad trick for getting dens dug and hydrants watered. The one that makes any decision first doesn’t have to bite anybody twice for the whole pack to start digging and watering like he- or she- growls I mean says. And also, since mice are as much nourishment as a single meatball, if anybody eats it means everybody nails same deer on the “yap”! Meaning that for any wolf, “lone” is another growl for “dead.” And in Seattle, energy bars don’t scamper around the office squeaking. So bark, snarl or woof, Al, project’s already yours. >> Without pavement, almost everyone suffers. I beg to differ. Some pavement is definitely quite nice. But we have way more pavement than we need. This morning’s first order of business. Put our own divisions on hold for about two years and use the time on what we agree on The line from West Seattle to Ballard has two ends. Working drawings for both a West Seattle subway and elevated, and for two possible Ballard station locations same. Both Lynnwood and Everett deserve five miles of two-way I-5 express lanes between Northgate and Seattle. Both and a lot of similar things that have to be done whatever else we do or don’t get done. Needing much less time than we lose with this morning’s approach. Our political system has a means for changing office-holders between elections. Can probably pull up recall petitions with next key-click. And focus much attention by this afternoon’s news. But a lot more important: mdnative, any names in mind? I don’t vote in Seattle, and I’m long-winded and unreliable. Evidence speaks for itself. But today’s positing needs a long string of followups with a enough technical knowledge about transit to build some. Because seriously think that this morning, nobody in charge of either transit or Seattle wants their own job anymore. And somebody has to do all of them. And md…https://en.wikipedia.org/wiki/Golden_Horde. Opposite of ignorant and leaderless. Admission about the Mayor. Couple of personal scores best kept sheathed right now. But have we got any united political organization at all underneath our own individual efforts? Because until we do, transit has absolutely nothing to say for itself. Floor’s open. David, I’m encouraged, but please find a benefactor or donors ASAP, slap together a website, and then blanket the city with mailers ahead of the 2019 primary. There are seven council seats in play! Floor’s open! Link has several mentions about sugar worth some attention. Instead of taxing sugar (but honest, what a load of crap how people are starving for Mountain Dew- except come to think of it, Red Bull could be worse than opioids) just give them a fair price for renewable fuel. Brazil? Haiti? Maybe Liquor Control will leave our pumps alone and concentrate on weed. Would leave Vape alone because it not only makes your car smell like it’s a moth ball on fire but the fire department can’t resist target practice. But most problematic of all, can envision our Mayor walking back to the Edmonds Ferry through Kingston, after coming out of True Value singing about how she’s walkin’ down the road (SR104) with a ratchet in her waist. The dread-locks won’t hurt her image either. Hey, it’s about time, Jenny-girl! But most satisfying of all, now the new sugar tax-arrangement works a lot better than the head tax- Lord what an embarrassment how Metro drivers just about cleaned out the Pacific hanging those from their mirrors. And too bad for the rest of the country that the price of gas is not fine any time of year. Would apologize to Harry Belafonte and the Kingston Trio- ’til I found out those guys were really from Palo Alto. Don’t think VAT transit even goes there yet. Just Mountain View. Maybe she could find a retired highway build– oh, I mean state-level DOT director. I feel like SDOT, and all of us who use their “products” are quickly approaching, if not standing on, a very dangerous precipice. Someone, fast, hast to return accountability and successful outcomes to a long list of projects before Seattleites DO start voting ‘no’ on transportation projects, or just become apathetically detached forever. Doesn’t anyone in the agency care about how sucky they appear to the public? I work for a federal agency, and man, the amount of multi-level head rolling that would follow such a lengthy list of failures would be epic. For one of the few agencies that touches everyone in this city, this is a tragic story. Funny, the buses are still more frequent and reliable than they were before the TBD or Move Seattle, so there’s a success. The general public may have only a hazy understanding that buses are more frequent and some rechannelizations work (Dexter, Roosevelt), but I as a frequent rider certainly notice it and am glad of it. And Madison RapidRide has been moving along. I do see people eventually getting transit-tax weary and wishing they had accomplished more. I’m particularly concerned about Move Seattle’s seven RapidRide line promise, especially with Link’s inconvenient stations in UW and Mt Baker and potentially in Ballard, and its egregious escalator/elevator problems. (Even my relatives in Bellevue read about that and asked me, “Why aren’t the escalators working? Why isn’t ST fixing them immediately?”) But to say there’s no accountability or success at all is going too far. Lol. Yeah it is funny how new tax/fee funding streams provide for some successes. Have we really set the bar this low? My bus is supposed to come every 10 minutes at rush hour (after the NE service cuts… er, “restructure” which actually cut other bus options for me). Now, every day at rush hour the only bus I can take is always late from a range of 5 to 15 minutes (but not at the same intervals, so no scheduled consistency), and are typically overfilled because Metro has small buses on the route instead of the double buses. So forgive me if I’m not impressed with the “more frequent and reliable” buses. Yeah, I’ll be voting “no” in the future on a lot of things I always voted “yes” on given the fact that we’re being given a pile of garbage and then told it’s apple pie. I’m not sure why everyone is upset about this. We had a choice: a prosecutor or an urban planner. We chose the prosector. I wish we’d chosen a prospector. We’d all be so rich we’d be up to our eyeballs in GOLD by now. OK. Straight out of Serengeti. Where all the buses have exhaust hoses coming out of the roof because even if storm drains get cleaned on time, roads often six feet underwater and for pot-holes you need a diving bell. I think “Prosecutress” is best title, since among the top predators, the ladies do all the killing. Reason she’s been lying there pretending to be asleep by giving press statements resembling it is that she cannot see anything unless it’s moving. This is what a political movement is for. Of course the more it looks like a wildebeest the better. Tan Toyota SUV about right. Wiggle the steering wheel to get her attention…and have the dart and and the tag applicator ready. She’ll wake up with a brand new shiny combat medal in her ear. And every political organization needs a few claw-marks on its hood for street cred. Works all the time at Ngorongoro. Just lets always keep our eyes open and don’t get caught hanging around. To paraphrase a former Defense Secretary, you plan transit with the politicians and SDOT you have, not the ones that you want. (Otherwise, we would argue, like this blog did, for Farrell in the primary; we could also criticize this blog for not asking Kubly about his ST3 plans or thinking (e.g., two downtown tunnels? how do you cross the ship canal? how do you make West Seattle rail useful?). We thought she would be moderately better and prioritize at least some transit ideas. She seems to be supporting the previous plans and allowing them to continue (minus the uncertainty of the CCC), but what I haven’t seen yet is championing any of them or prioritizing any of them, or offering her own new vision and ideas. We thought Durkan or Moon would be mostly identical, with Moon having slightly more urban vision and priorities, and Durkan more an expert in making the basics run smoothly and having more citywide support. Instead it seems that Durkan is a C in transit, maybe C or B- in land use depending on how HALA/rezoning go, and C on everything else. I agree Mike. I voted for Durkan and I’m very disappointed in her performance so far. I thought she would be pragmatic; less progressive but better able to get important things done. I thought her decision to delay/hopefully cancel the flawed CCC project was evidence of such pragmatism but it is becoming increasingly clear she isn’t against the CCC because it is a flawed transit project but rather that it is a transit project period and not another piece of auto infrastructure catering to SOVs and SOVs only. As a cyclist, the 35th Ave boondoggle has really changed my opinion. The “save” 35th folks should have been told to go pound rocks from the start, not coddled with a secret mediation paid for with funds stolen from the bicycle safety fund. What kind of precedent does this set? I eagerly await the final decision from the mayor’s office but have little reason to hope for a reasonable outcome. The next election to replace Rob Johnson will be interesting. Will the district vote for a transit/village urbanist again, or will the “Save 35th” type NIBYs come back into power? The switch to district seats was spearheaded by them to throttle development and the war on cars and downtown-centrism, but the first district elections brought mostly the opposite. Will the reactionaries come roaring back? Or will the “Save 35th” type crowd and those who tried to block parkingless apartments in Greenwood be proven to be a loud minority? The mayoral election seems to indicate the latter, since people thought Durkan would be more supportive of urbanism, and in any case she’s not a die-hard reactionary like some other candidates were. I hope that the urbanists and urban-moderates will continue winning elections, and that will give them more confidence to tell the reactionaries where to go. We don’t need to be behind Canada and Europe, we can do it. I think I can I think I can. The neighborhood-association-power advocates and the socialists already have strong candidates in the District 4 race. It is hard to tell how the socialist candidate feels about upzones. I want to vote for the socialist candidate, but his description of upzones as give-aways to private developers makes it very hard to do so. I want a real urbanist to support, who will push for higher upzones to build more market-rate housing, while also pushing to build more public housing, and non-profit housing. All three, not public-only. Calling people who want new private housing to be allowed “free market urbanists” says more about his politics than it does ours, but it also speaks to his priorities between ideological purity and reducing the suffering of the masses. And it speaks to how unseriously he takes the urbanist voting bloc. I will say that the biggest deal-breaker for me is candidates who refuse democracy vouchers. They were either not going to win anyway and know it, or they hope to win through the power of large contributions. I can only assume that any candidates who win while refusing the vouchers intend to vote to axe the program. Given that the Chamber has not been much of an ally of urbanists or transit advocates lately, I see no particular reason to vote for Chamber candidates any time soon. And of course, I will definitely not vote for NIMBY candidates. Nice. Who needs an SDOT ‘Director’, when we can get a mass transit Czar instead! err.. this job was supposed to be hired last January? Better late than never I guess. It does seem that there is a certain lack of urgency in the Mayor’s Office on a number of different things. Hopefully this works out well. What do you mean, we got a new Hockey Team! Priorities, priorities. Now if we could just get down to watch a game. For the past couple years, I’ve been voting with my feet not to attend any events at Seattle Center until the monorail takes ORCA, and its associated passes and transfers. This interminable delay is not a problem waiting for an SDOT director. It is because the monorail is under the auspices of the Seattle Center, and used as a profit-generating ferris wheel ride to raise money for Seattle Center programming while being far from full even during peak hours. Of course, the profit is on operations, but the taxpayers still pay for all the maintenance. The council could, if it chose, refuse to fund said maintenance until the executive branch gets it together and gets the monorail ORCA-ized. Watch this contract come up for an addendum motion at a future ST board meeting to modify the amount. It likely will be over a million eventually, all on ST’s dime. What’s another unbudgeted million $ plus in the greater scheme of things when it comes to North King County’s subarea plan? (RQ) ST can simply continue to fudge their subarea reporting or go cheap on some vertical conveyances somewhere. It is really small potatoes, and we needed someone like this two years ago. ST3 was a mess, and the lack of leadership in Seattle played a big part in that. Rather than fight for sensible plans, or stand up for cities (like Kirkland) that did their own, independent work to show that there are better alternatives, they just built whatever Dow and friends wanted. West Seattle rail and a second tunnel, with *no new stops downtown*? Sure, why not? Yeah, most cities would prioritize areas with much more densely populated communities with stations that lend themselves to obvious urban stop spacing. They might consider the overall transit network, rather than serving a handful of people in a largely mid-level (at best) residential area. Most cities — if they really did build another tunnel downtown — would maximize coverage there, because just about everything in an area like that has huge ridership and transportation issues. But no, not Seattle. We just wing it. We just build whatever sounds good, and when asked, guys like Murray and Kubly say “why not?”. They won’t lose their job over the issue — they’ll be long gone before any of this is built. If Ms. Fennessy makes even one smart decision — if she avoids just one self inflicted Sound Transit mistake — she will have earned her salary ten times over. Just building the Ballard station in Ballard (at 15th) would be a huge accomplishment, and — get this — actually save Sound Transit money. The last paragraph is spot on. Maybe not ten times, but well worth the position. I don’t know why it’s a special position (not the SDOT director or a staff member), or why ST is paying for it, but at least it’s a clear way to move forward. And one example of a Durkan vision or idea. Really, why is ST paying for it? Is it because Seattle is the biggest city? Do Bellevue, Tacoma, and Lynnwood-or-Everett have this too? Do Burien and Des Moines and Issaquah and Mercer Island have ST-paid liaisons too? ST3 won. Get over it. It wasn’t what you wanted, and I’m glad it wasn’t what you wanted. What you wanted would have lost, and certainly not gotten my vote. Light rail to Ballard and West Seattle are two of the best elements of ST3. Other than the fact that the West Seattle line goes a few blocks too far to serve the wrong side of the density island, instead of turning south to serve poorer neighborhoods, I don’t really have a complaint that West Seattle was included. The West Seattle Bridge bottleneck that already has a bus lane that just doesn’t really do the job, and the desire for many to ride downtown, make it an obvious place to put a line. Kirkland has its own plans, ditched those plans, and cowered under the threats of rich homeowners when it was time to ask for ST3 projects. Kirkland is the prime example of the worst possible approach a city can take toward a regional transit authority. It’s not so much the “small potatoes” that I take issue with; it’s the process involved that leaves a lot to be desired. Putting aside the whole no-bid nepotism issue in this particular case, the city could’ve just hired to fill this need and then struck an interlocal agreement with the agency to pay for x FTE hours at x $ rate for reimbursement, as they have done a number of times with multiple jurisdictions in the past. These “small potatoes” contracts that just get rubber stamped add up to significant dollars over time, especially when one considers how frequently they get an addendum attached to them. ST has authorized scores of them over the years. Listen. I get the whole penny wise, pound foolish argurment. Given the limited resources the district has, the high stakes involved with this huge transit plan (Sound Move, ST2 plus ST3) and the critical need of the region to improve transportation and transit now and for the future, we damn well better get things done right. With that said, have we really set the bar this low with the competence of the supposed experts at ST, employed and contracted, that we need these liason type positions to serve as a check on that level of competence? Perhaps so. To paraphrase Bill Murray’s character in the movie Stripes, SDOT without a leader is like a foot without a big toe.